Chiparus Bronze, "Young Pipes Player"
Please refer to our stock # 5054 when inquiring. Chiparus portrayed children in his earliest works. This rare and massive example depicts a spirited youth playing pipes. 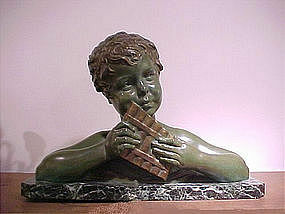 Detailed casting by Etling, the artists early foundry. Greenish patina with contrasting golden-brown high lights to hair and pipes. A similar subject shown in a photo with Chiparus in his studio; page 13 in "Chiparus-Master of Art Deco", by Alberto Shayo. Dimensions: Height 15", Length 21", Width 6 1/2".